Sri Lankan President Maithripala Sirisena reportedly sent two special representatives early this week to India with a letter to the ailing Dravidian Tamil political patriarch Muttuvel Karunanidhi wishing him a speedy recovery. Karunanidhi known widely as “Kalaignar”(artiste) has been leader of the Dravida Munnera Kazhagham (Dravidian Progressive Federation) since 1969 and served as chief minister of India’s Tamil Nadu state for a total of 19 years. The nonagenarian “Kalaignar”Karunanidhi who celebrated his 94th birthday on June 3rd has held office as Tamil Nadu chief minister five times from 1969 -71, 1971-76, 1989 -91,1996-2001 and 2006-11. Karunanidhi was admitted to the Kauvery hospital in Chennai last week due to a urinary tract infection and steep decline in blood pressure. He also underwent some tracheotomy procedural changes to help him in breathing.The latest medical bulletin issued by the hospital stated that Karunanidhi’s vital signs have gradually normalised, but he woould continue to be hospitalised due to the overall decline in his general health given his age(94). Karunanidhi’s health has been on the decline since 2016.The silver tongued orator renowned for his powerful speeches over the years has been “silenced” due to a speech impairment.His movements too are restricted and has to be pushed around in a wheel chair. Still he has been receiving and meeting dignitaries and also visiting the DMK part office “Arivaalayam” (Temple of Knowledge) from time to time. Karunanidhi still remains the Party leader, a post he has held for more than 49 years. While Karunanidhi remains as “De Jure”DMK leader, his son MK Stalin functions as “De-Facto”DMK leader and heir apparent in his capacity as “Seyal Thalaiver” or Working Leader. Indian news reports said that former Sri Lankan Cabinet minister and Ceylon Workers Congress (CWC) Parliamentarian Arumugan Thondaman along with CWC stalwart and Uva Provincial minister Senthil Thondaman visited the Kauvery hospital at Aalwaarpaettai in the Tamil Nadu capital of Chennai where Karunanidhi is currently recuperating.After visiting Kauvery hospital Arumugan and Senthil Thondaman also called on M.K. Stalin the son and political heir of Karunanidhi who is the “Seyal Thalaiver” (working leader)of the DMK and handed over the “get well soon”letter sent by Maithripala Sirisena.The indian media described the two Thondamans as special emissaries of the Sri Lankan president. Meanwhile thousands of DMK members and supporters from all over Tamil Nadu have flocked to the hospital premises mounting vigil over their leaders health.They keep chanting “Neendu Vaazhha Thalaivar” (live long leader) and “Meendu Vaa Thalaiva,” (come back leader). There have been widespread outpourings of grief in the state and despite the “atheist/agnostic/rationalist” ethos of the Dravidian movement, special poojas seeking the blessings of the amighty have been conducted in different places of worship. A very large number of Indian political leaders including Indian Vice-president Venkiah Naidu, Defence minister Nirmala Sitaraman and Congress party chief Rahul Gandhi have visited Kauvery hospital. Many others including Prime minister Narendra Modi keep inquiring about the DMK leader’s physical condition. Many eminent personalities issue statements and tweets expressing concern over Karunanidhi’s health. In Tamil Nadu despite deep political differences there is a genuine consensus of concern over the DMK patriarch’s health. Whatever may be his faults and foibles in his colourful yet chequered political past, Muttuvel Karunanidhi is no ordinary politico but a veritable political institution. Although the patriarch of Dravidian politics in Tamil Nadu state, the veteran politician Karunanidhi is arguably India’s elder statesman. He was first elected to the State legislative assembly in 1957 and has not lost an election since. No Indian politician can boast of such an unbroken record. He has been at the helm of the DMK for 49 years leading the party through thick and thin. He was dismissed as state chief minister twice by the central Government of India. His party was defeated several times at the polls. On one occasion Karunanidhi was the sole victor from his party at Assembly polls. In spite of all these setbacks the indefatigable Karunanidhi has always bounced back. His ardent supporters would fervently hope that their leader would once again “return” this time too. Karunanidhi was born on June 3rd 1924 in the village of Thirukkuvalai now in the Thiruvaaroor district of Tamil Nadu. 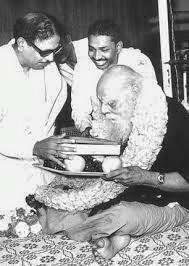 His parents Muttuvel and Anjugam were of Isai Vaelaalar stock. The Isai Vaelaalar community has been historically a talented artistic community. Some of India’s greats in the spheres of music,dance,drama and cinema hail from this caste group. Karunanidhi’s given name at birth was Daksinamoorthy.He later changed the “sanskritized” Dakshinamoorthy to the more Tamil sounding Karunanidhi. His foray into active politics was in 1938 when he participated in an anti-Hindi agitation at the age of 14. He formed a student political organization while a high school student and started the journal “Murasoli”(drum beat) which still remains as the DMK flagship newspaper. Karunanidhi quit secondary school studies and became a political activist while working freelancein newspapers and contributing articles.He also became a stage actor and playwright. Later he ventured into films as a script writer. This brought him much recognition and more remuneration which helped him greatly to carve out a name for himself as a politician. He was a versatile, multi-talented writer and stage actor. It was the well-known actor M.R.Radha who bestowed upon him the title “Kalaignar”(artiste) when the drama “Thookumaedai”(Gallows) was staged for the 100th time. 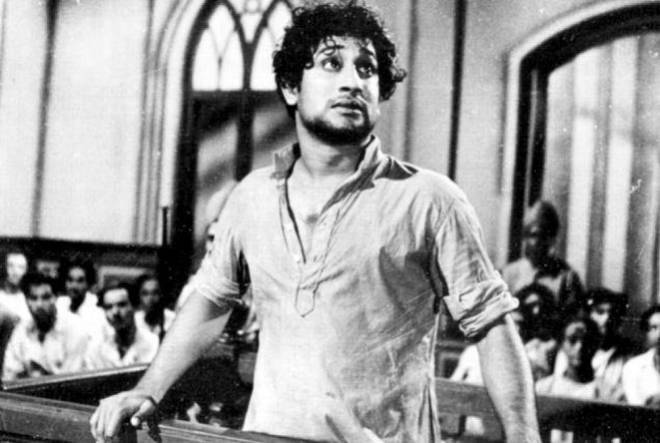 Karunanidhi wrote and acted in the play. “Kalaignar” Karunanidhi developed a writing style for cinema that was flowery and alliterative(adukku Mozhi), and soon became very popular. Courtroom scenes, inquiries in royal courts in historical movies and short dramas introduced into films that had a modern setting, provided ample scope for Karunanidhi’s captivating prose. His reputation had producers advertising their movies by proclaiming, “Story and Dialogue by ” Kalaignar Mu. 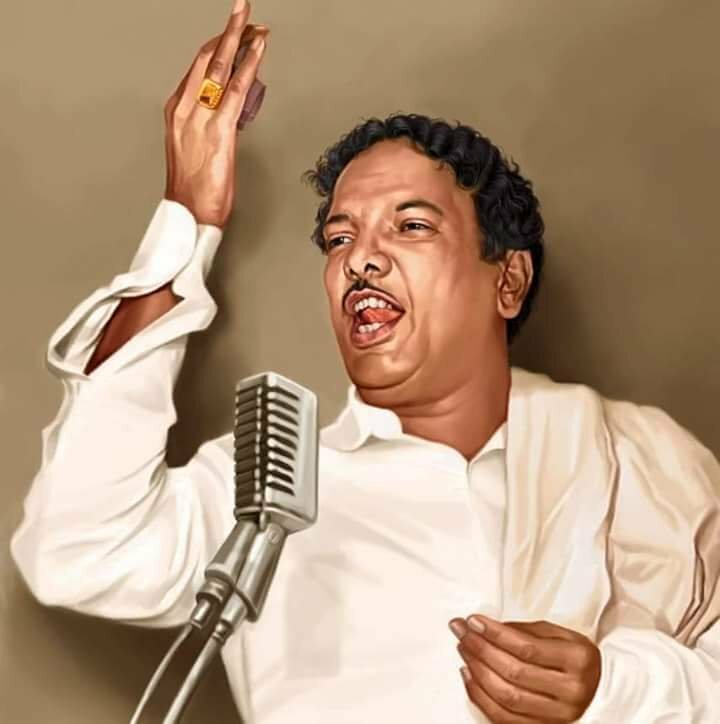 Karunanidhi”. When film titles were projected in the cinema halls, his name would be shown ahead of the stars and greeted with applause. There were others to follow Karunanidhi in both content and style from the DMK camp — Aasaithamby, Krishnaswamy, Maaran and Kannadasan etc. But Karunanidhi was the master in that genre surpassing even his mentor and leader Annadurai. Karunanidhi has written the screenplay and dialogues for over 60 films.The first two films he wrote scripts for were “Rajakumari” and “Abhimanyu”. However Karunanidhi was not credited for those films. It was his third film “Marutha Naattu Ilavarasi” released in 1950 for which Karunanidhi was first credited as script writer in the titles. Among the films scripted by Karunanidhi are Manthiri Kumari, Parasakthy, Manamahal, Panam, Manohara, Thirumbi paar, Malaikkallan, Pudumaippithan, Kuravanji, Raja Rani, Arasilankumari, Iruvar Ullam, Rangoon Radha, Pudaiyal, Kaanchi Thalaivan, Poom buhaar, Poomaalai, Avan Pithanaa, Marakka Mudiyumaa, Pillaiyo Pillai, Paalaivana Rojakkal,Uliyin Oasai and Ponnar Shankar. It is said that he received 3000 rupees for his first film However in later years he got up to 75 Lakhs of rupees to script a film. Kalaignar also formed a film company called Mekala Picturesin partnership with others and produced several films. Later his nephew and former Indian Cabinet minister “Murasoli” MK Maaran took over the company. In addition to being a script writer and playwright, Karunanidhi has also written film songs. He is also a reputed writer having written many novels and short stories. He is also well-known for explain ing classical tamil literature in elegant yet simple prose.Two of his outstanding works are “Kuraloaviyam” and “Sangath Thamizh”.He has also wriiten a four -part auto-biography named “Nenjukku Neethi”. Interestingly Karunanidhi’s family has had and continues to maintain close links with the Tamil film industry. Apart from Karunanidhi, his nephew and former cabinet minister M.K. Maran – who is no more – was also a former film script writer. Maran’s brother Amirthamwas a cinematographer. Maran’ssons Kalanidhi and Dayanidhi are co-owners of the “Sun” groupTV network . They also produce films under the banner “SunPictures”. Karunanidhi’s son and heir apparent M.K. Stalin too has dabbled in acting, as the hero of a TV serial “Kurinji Malar”. Stalin’s son Udhayanidhi is both a successful film producer as well as actor who has played the hero in many Tamil films. His wife Kiruthiga directs films. Karunanidhi’s younger son Thamizharasu’s son Arulnidhi has made his mark as lead actor in some films. Elder son Azhaghiri’s son Dayanidhi is a film producer and distributor. Karunanidhi’s eldest son MK Muthu also had a short lived film career as an actor-singer. Moreover the DMK chief’s “second wife”Rajathi was also a stage actor who got involved with Karunanidhi as his “Thunaivi” when acting in dramas penned by Kalaignar. Their daughter Kanimozhi who is a Rajya Sabha MP is the owner of “Kalaignar TV. If cinema and politcs are inter-twined in Tamil Nadu then Karunanithi’s family seems to be immersed in both. The Dravidian movement also spawned a school of actors who could effectively mouth the lines written by script writers of their ilk.. One of the early greats was the comedian N.S. Krishnan, known as Kalaivaanar, who made the audience both laugh and think. Krishnan was followed by a host of “Dravidian School” actors like K.R. Ramaswamy, M.R. Radha, T.V. Narayanaswamy, S.S. Rajendran (SSR) and Sivaji Ganesan. The last two in particular were able to deliver the powerful prose of Karunanidhi with great conviction and style. The Karunanidhi- Sivaji Ganesan combo was a great success. 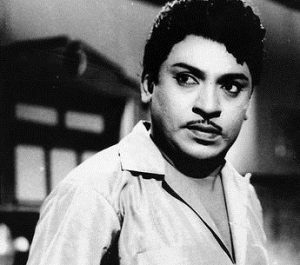 The big break in Sivaji’s career came in 1952, when he acted as the hero in ‘Parasakthi,’ a film directed by Krishnan-Panju. The dialogue, written by M. Karunanidhi in fiery and flowery prose with a surfeit of alliterations, the hallmark of Karunanidhi’s style, came powerfully alive in a stunning performance by Sivaji, unparalleled in Tamil cinema. The monologue uttered as an address to Tamil Nadu in the earlier scenes and the courthouse speech in the closing stages of the film were classic instances of delightful oratory.The Karunanidhi- Sivaji combination made an explosive impact. The writer’s rich prose, brimming with vitality, was given emotive and impressive expression by the actor. Every film in which they collaborated was a success. Notable among them were Thirumbi Paar, Manohara, Kuravanji and Iruvar Ullam. Sivaji had an extraordinary flair for dialogue delivery. He pioneered an exquisite style, diction, tone and tenor.Soon personal differences arose between Sivaji Ganesan and Karunanidhi, and the actor crossed over to the Congress party . To make up for Ganesan, Karunanidhi, whose dialogues were increasingly getting political, weaned an actor from the Congress camp into the DMK fold. This was M.G. 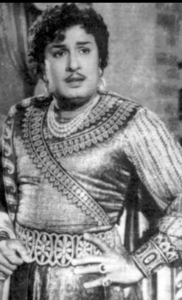 Ramachandran, until then a popular hero playing swashbuckling action roles. A unique feature of the relationship between the movie stars of the Indian south and their fans was the proliferation of fan clubs.M.G. Ramachandran probably encouraged the phenomenon of fan clubs from late 1940s onwards, and the clubs ended up as a well-knit federation that counted its membership in the millions. The clubs held annual conventions and also participated in social service projects. When MGR entered active politics, his fan clubs were in turn politicised and soon became an indispensable component of the DMK propaganda machine. The popularity of MGR within the party and state caused major convulsions. In a bid to counteract the phenomenon, Karunanidhi encouraged his eldest son M.K. Muthu to enter movies. The father, while in office as chief minister, wrote the story and dialogue for Muthu’s first film Pillaiyo Pillai (Oh, What a Son). Muthu Fan clubs were set up overnight, with father Karunanidhi’s backing. MGR, realising what was in store, engineered a split within the party in 1972 on the grounds of corruption charges against the incumbent regime. Incidentally, MGR did not have any problems in setting up new party structures —he merely converted his fan clubs into party branches. In 1977 the MGR led AIADMK defeated the Karunanidhi led DMK. 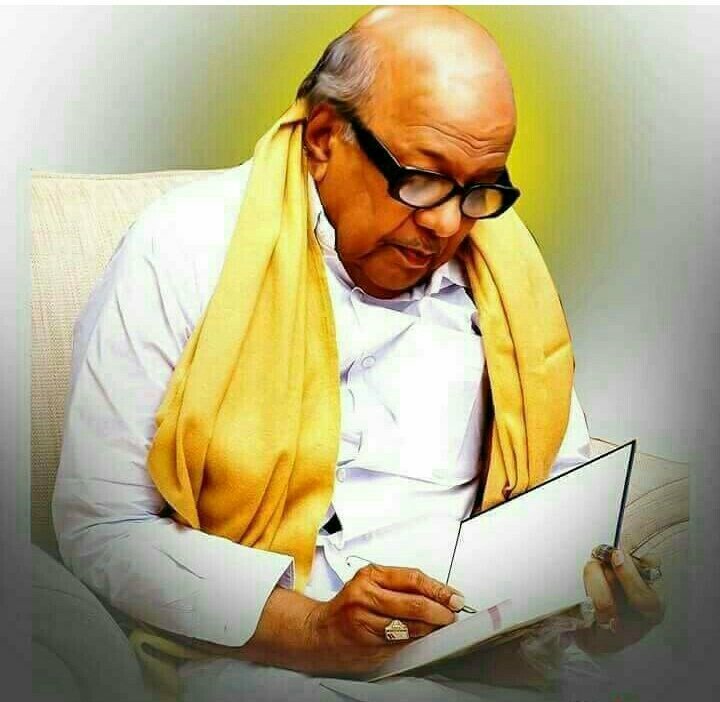 The bitter irony was that MGR had been brought into DMK politics by Karunanidhi and Karunanidhi had been helped to succeed Annadurai as chief minister in 1969 by MGR himself. Although Karunanidhi is known nowadays as a political leader(and rightly so) there is no denying that it was his association with films that gave him the necessary popularity with the masses of Tamil Nadu. This is due to the peculiar course of politics in Tamil Nadu where the influence of cinema on politics has been of a phenomenal nature. Popular film personalities have enjoyed great support among the masses. Unlike in north India, Tamil Nadu film personalities served as an integral component of their parties. In most cases, they were the ‘axles’ around whom their party wheel revolved. 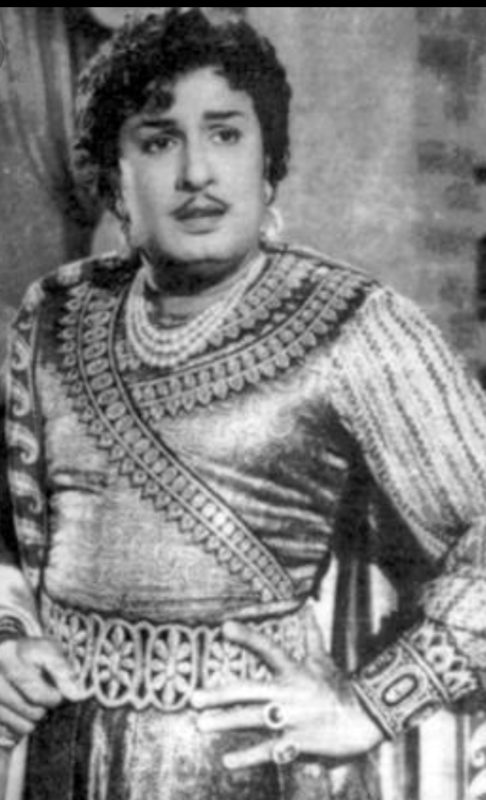 Significantly, from 1967, most chief ministers in Tamil Nadu have had connections to the silver screen – Annadurai,Karunanidhi,M.G.Ramachandran,Janaki Ramachandran and Jayalalithaa Jayaram.The exceptions have been the current chief minister Edappaadi Palaniswamy and earlier O. Panneerselvam nominated as “caretaker” CM on three occasions. With a population of more than 70 million , Tamil Nadu has the third highest literacy rate among the states of India. The state is also home to India’s original rationalist movement, started by E.V. Ramaswamy Naicker (Periyar). Known as the Suyamariyaathai lyakkam, or self-respect movement, it promoted healthy political protest against caste oppression, the imposition of Hindi as national language and superstition in religion. Periyar also founded the Dravida Kazhagham or Dravidian Party in 1943, to which both today’s ruling party All -India Anna -Dravida Munnetra Kazhagham(AIADMK) and chief opposition Dravida Munnetra Kazhagham(DMK) trace their lineage. 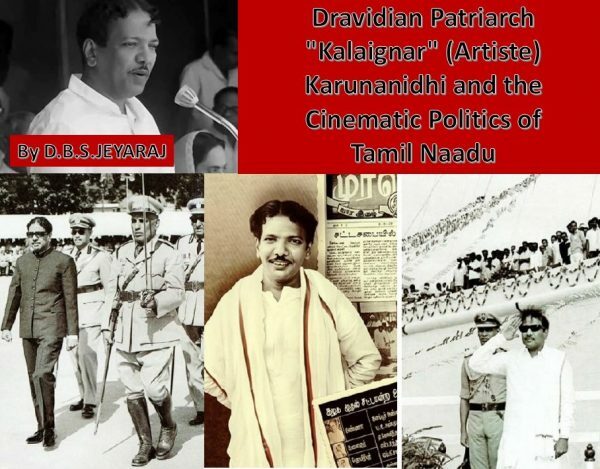 In spite of this “Dravidian” heritage of rationalism and self-respect, it is Tamil Nadu that has allowed film stars to exercise political hegemony like no other. How this situation came about is a bizarrely unique story. However, in South India, and particularly in Tamil Nadu, politics and cinema have been inextricably intertwined in a big way. The larger-than-life image of actors like N.S. Krishnan, M.G. Ramachandran, Sivaji Ganesan, SS Rajendran N.T. Rama Rao, and Jayalalitha, dominated the political scene. As stated earlier Political leaders like former Tamil Nadu Chief Minister M. Karunanidhi and his mentor and predecessor C.N. Annadurai also came in from careers in cinema, as screenplay and dialogue writers. The role of cinema in the political history of Tamil Nadu provides interesting insights into present-day developments. The politics of Tamil Nadu for the past 75 years has been pervaded by notions of the Aryan-Dravidian divide. This concept itself is not very scientific and has been greatly mythologised. Nevertheless, this Dravidian consciousness and ideology has helped politicise significant sections of the Tamil masses and has sustained whole political parties and movements. Dravidian languages are 19 in all, of which Tamil, Telugu, Malayalam, Tulu and Kannada are the most prominent. Interestingly, there were few takers for the “Dravidian” ideology among the other South Indian states of Andhra Pradesh (Telugu), Kerala (Malayalam) and Karnataka (Kannada). However, it took firm root in Tamil Nadu. The original political demand of the Dravidian parties was a Dravidian state comprising present-day Kerala, Tamil Nadu, Pondicherry, Andhra Pradesh and Karnataka. It later modified itself into a secessionist movement, focused on Tamil Nadu alone. It was only after the 1962 war with China that the DMK dropped its separatist demand in the interests of national unity and security. It now agitates for greater autonomy within the Indian union. The DMK was born in post-independence India. Karunanidhi’s ascendancy in politics basically corresponded with that of the DMK’s rise in TamilNadu. The parent Dravidian movement of the DMK was the Dravida Kazhagham(DK) founded by E,V.Ramaswamy Naicker known as “periyaar” (great person)opposed to participation in politics. It was also very much under his autocratic control. A group of dissidents, including Karunanidhi, revolted under the leadership of Conjeevaram Natarajan Annadurai and formed the Dravida Munnetra Kazhagham(DMK) in 1949. Starting out as a social reform movement, the DMK later decided that change was impossible without capturing political power through democratic means. In 1957, the DMK decided to enter electoral politics and secured 15 seats in the state assembly and two in Parliament. In 1962, the figure went up to 50 in the state assembly and eight in Parliament. 1967 saw it capture power for the first time when it got 138 out of the 234 seats in the state. The DMK also won all the seats (25) it contested for the Lok Sabha. Annadurai became chief minister. He changed the name of the State from the previous Madras to the present Tamil Nadu (Tamil Country/Land). Annadurai died in 1969.He was succeeded by Karunanidhi who was earlier the Public Works minister. In 1971, the party registered a landslide victory when it captured 184 seats in the state and 23 in Parliament. The party seemed invincible. But 1972 saw a major split. The DMK’s chief vote gatherer and matinee idol Maruthoor Gopalamenon Ramachandran, or MGR, broke away from the party and floated his own that year. He named it after Annadurai and called it Anna DMK. It was later changed to All India Anna-DMK.MGR’s party won three elections in succession, securing 125 seats in 1977, 130 in 1980 and 125 in 1984. Karunanidhi had to remain content as opposition leader for 11 years. When MGR died in 1987 December, his wife Janaki succeeded him. But the government fell after one month due to Congress machinations. With MGR’s leading lady and then propaganda secretary Jayalalitha also staking her claim to party leadership, a split resulted. In 1989, a divided ADMK contested as two factions led by Janaki and Jayalalitha. The Janaki faction (one seat) was trounced by Jayalalitha (24 seats) but the DMK under Karunanidhi romped home the winner. After Rajiv Gandhi’s death, the Jayalalitha-Congress combine routed the DMK in 1991. Only its leader, Karunanidhi, managed to win. In 1996, the DMK was returned to power and retained it till 2001.Jayalalithaa returned to power in 2001 and was de-throned by Karunanidhi and the DMK in 2006.The wheel turned again in 2011 and Jayalalithaa became Chief Minister. She followed it up by winning again in 2016. However she fell ill and passed away in December that year. Her arch rival Karunanidhi too had begun to decline in health since 2016 and is now hospitalised. The doughty political fighter of yore may very well pull through to live for some more years. But it is certain that his political life is over. It is against this backdrop that popular actors Rajinikanth and Kamal Haasan have both started political parties. .The chief reason for Rajinikanth and Kamal Haasan forming their own political parties at this time is because the political climate seems ripe for their entry into active politics in Tamil Nadu. The state has been ruled since 1967 by either the DMK and/or the AIADMK. Currently there seems to be a political vacuum in the state. After AIADMK supremo Jayalalithaa Jayaram passed away her party, though still ruling the state, has fractured into four factions led by ex-Chief Minister O. S. Panneerselvam, present Chief minister Edappaadi Palaniswamy, Jayalalithaa’s “UyirThozhi” (life friend) Sasikala Natarajan (currently in jail) who was also appointed AIADMK interim General Secretary and Jayalalithaa’s niece Deepa Jayakumar. The BJP Central Government has “unified” the Panneerselvam-Palaniswamy factions temporarily and is manipulating the AIADMK State Government like a puppet on a string.The recent by-election at RK Nagar saw Sashikala’s nephew T. T. V. Dhinakaran contesting as an independent defeating both the AIADMK and DMK candidates. It’s a fragile situation for the AIADMK administration in Tamil Nadu. CM Palaniswamy’s days are numbered. The DMK is not doing well either. As is known the ailing Party leader and former Chief Minister Muttuvel Karunanidhi (94), is hospitalised and virtually dysfunctional. Karunanidhi’s son M. K. Stalin has donned the leadership mantle but there are strong doubts whether he can deliver. The recent RK Nagar by-election was a shock to the DMK. It was expected that the DMK would win because the AIADMK votes were split among the official candidate and the dissident independent candidate. In spite of split votes, the independent candidate came first and AIADMK candidate second. DMK finished a poor third. Of course the “cash for votes” syndrome was rampant. Attempts by smaller parties including the leftists to form a common front as a third alternative failed miserably at the 2016 polls. Casteist and parochial parties have a community vote bank but are unable to transcend those barriers. The BJP and Congress have again and again demonstrated that their national appeal does not work in Tamil land. Against that backdrop it is felt that a political leadership vacuum exists in the state. There is a need for change from 50 years of Dravidian politics. Kamal Haasan and/or Rajinikanth with their millions of fans may very well step in and become political forces to be reckoned with in the state. If that happens the days of Dravidian ideology dominance in the state are numbered. It remains to be seen whether the impending demise of Dravidian patriarch Karunanidhi will sound the death-knell of Dravidianism in Tamil Nadu or not.